During the Rákóczi war of independence (1703-11) some of the Serbians moved to the south and afterwards more and more German settlers arrived down the Danube from the German Empire. That is why the territory of Tolna and Baranya are called Schwäbische Türkei. The majority of the Hungarians in this area are Protestant, this fact indicated in the interiors of houses, e. g. by the oleographs of patriotic themes. The immigrant Germans were mostly Roman Catholic or Lutheran, the Croatians and Catholic Serbians were Roman Catholic, and the Serbians belonged to the Eastern Orthodox Church. Although the tradition of viniculture in South Transdanubia dates back to Roman times, the famous red wines of Villány and Szekszárd can be considered as a heritage of the Serbians, who settled here in the 16-17th centuries. It is Szekszárd where the first type of bikavér (Bull's blood) was blended from various species of grapes. Such outstanding personalities of Hungarian culture can be associated with this region as Janus Pannonius, Miklós Zrínyi and Mihály Babits (poets). Not only the population of this region but its settlements and buildings are also varied. 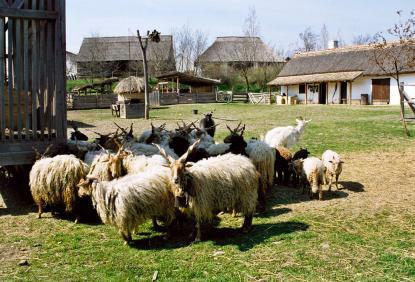 While in the more isolated western parts of South Transdanubia timber-framed, thatched wooden buildings with black kitchens were present up to the beginning of the 20th century, in the eastern half of the region, closer to the Danube - the main line of communication - a more developed architecture with solid walls was widespread. This dichotomy is shown in our regional unit as well: on both sides of the wide street houses with solid walls are standing in their yard; while on the sites of the irregular settlement part timber-framed buildings can be found. The regional unit is closed by the wickerwork fence characteristic of the whole region; outside the gate structures of agricultural function - the vineyard, the enclosure of barns - and the cemetery are situated.